Add yeast, sugar, and the warm water to a bowl and whisk until dissolved. Add the flour, salt, olive oil, and water and knead into a shaggy dough with a hand mixer fitted with dough hooks. Remove from the bowl, knead briefly, and shape into a ball. Place it back to a bowl, cover with kitchen towel or plastic wrap, and let rise until doubled in size, approx. 45 min. Meanwhile, make the sauce. Mince the garlic and the anchovies. Finely dice onion and chop spinach into strips. Heat some olive oil in a saucepan. Add anchovies, garlic, and chili flakes, and sauté approx. 1 min. Add tomatoes and dried basil, bring to a boil, decrease heat, and simmer approx. 10 min. until reduced. Season with salt and pepper, set aside, and let cool. Heat some olive oil in another frying pan over medium-high heat, then add spinach, and cook until just wilted, add red onion and cook until all the liquid has evaporated. Preheat oven to 180°C/350°F. Brush a sheet of parchment paper with some olive oil. Flour a working surface and roll dough out into a rectangle. Transfer the dough onto the parchment paper. Layer on slices of fennel salami, followed by the prosciutto, leaving approx. a 3-cm/1-in border around the edge. Tear mozzarella and place on top, spoon on the cooked spinach, followed by the tomato sauce. Pick up the the side of the parchment paper closest to you, lift it up and fold over, rolling the dough into a tight log. Pinch along the seam and tuck in the ends. Brush the top with some olive oil and, using a sharp knife, gently score the top of the dough with incisions about 5 cm/ 2 in. apart from each other. 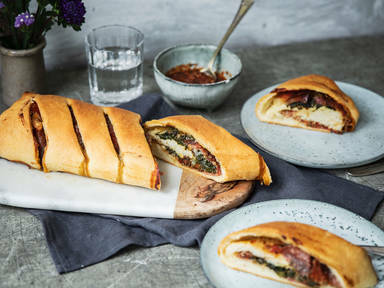 Bake Stromboli at 180°C/350°F until the crust is golden brown, approx. 50 min. Brush with more olive oil and bake again for approx. 5 min. further. Remove from the oven, transfer to a wire rack, and let cool for approx. 10 min. Then slice and enjoy!